"I bought Smokey off the tailgate of a pickup truck in Belle Fourche, South Dakota, where I met the breeders (Michelle Mollman from Triple M Kennel) halfway. 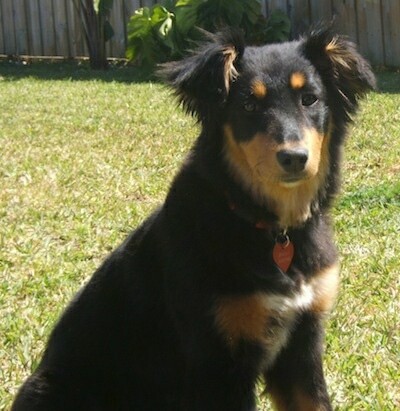 I was told that the litter was a mix of English Shepherd, Border Collie and Australian Kelpie. 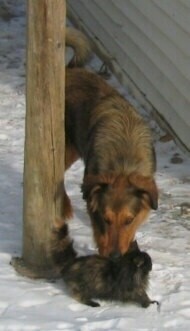 This was in the very beginning stages of the Dakotah Shepherd’s breeding program. Smokey was from one of the first generation’s foundation, stock even before the name "Dakotah Shepherd" was decided upon. Smokey was born in February of 2004. Smokey is a neutered male. When he was 2 years old he weighed 56 pounds at a height of approximately 22". His colors: sable, white spot on breast and the coat is long and coarse. 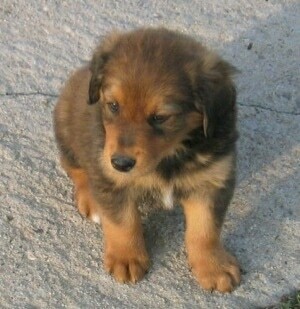 There were one or two tricolors in the litter as well as all-sable puppies. Smokey is athletic and fast. He loves to go for walks. 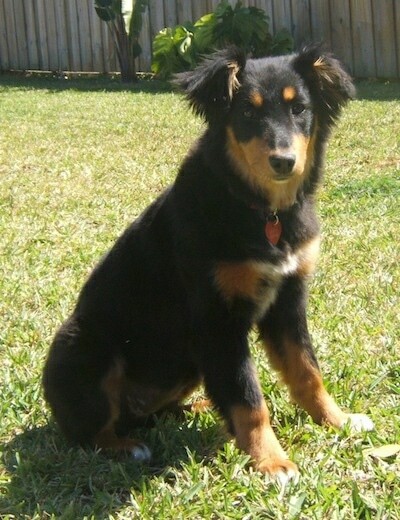 His father is an English Shepherd, mother Border Collie / Kelpie mix. 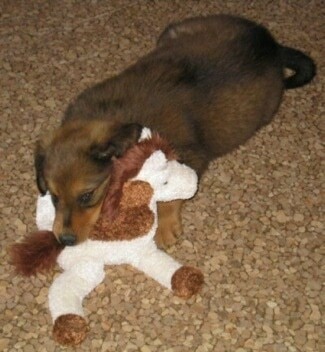 Smokey is very laid back for his breeding (herding dogs), sensitive, smart, listens very well. Affectionate, but does enjoy some "me"-time, too. He loves water and rolls in every mud hole, but would never swim. Loves to drive in the truck. Smokey also likes squeaky toys, fetch, hunting rabbits and chasing horses (and he sure is not allowed to do that!)." 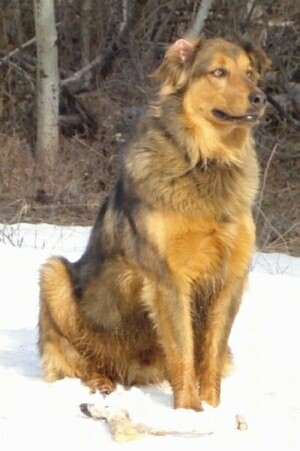 The Dakotah Shepherd is usually black and tan or shades of sable; other colors may be available in the future. Many have blazes and white feet. 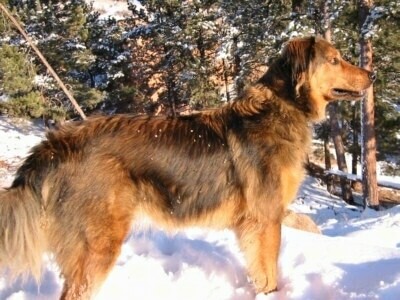 The Dakotah Shepherd is a very loyal dog that loves his family. Extremely smart, he is capable of very flexible training and can be trained for herding, agility and therapy to a high level of obedience. Very gentle and great with kids. This dog needs to be taken for daily walks or jobs to release his mental and physical energy. He will very much enjoy a job to do and will be more than willing to go out and work. He also enjoys playing with the family, satisfied to be in their company. With proper exercise the Dakotah Shepherd is not a hyper dog, nor is it yappy/barky; generally a very quiet dog. Could be a watchdog, but would only warn you of intruders. They are not bred to be guard dogs. No known health problems at this time. The Dakotah Shepherd should have at least a medium-sized yard. The Dakotah Shepherd needs to be walked daily. Haircuts not required; they have short to medium coats. Seasonal shedding, mostly in the spring and during hot temperatures. This is a new breed started in about 2004, which is being created by Triple M Kennel, from the English Shepherd and the Dakota Shep Foundation. Some of the breeds in the lines are the English Shepherd, Border Collie and Australian Kelpie. 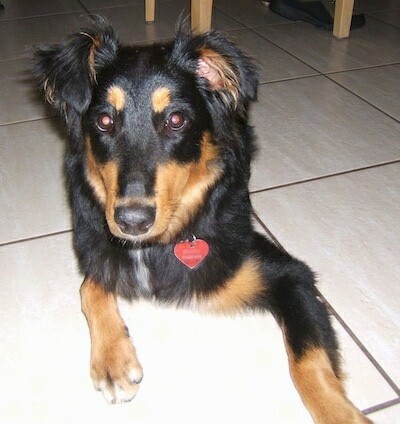 "Shayla is a Dakota Shepherd that lives in Miami, Florida, with her friend Cindy, a Shih-Tzu. 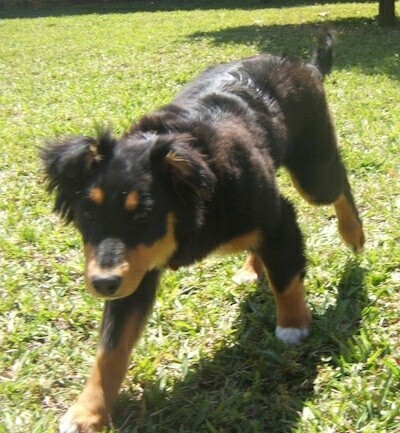 Shayla enjoys running and fetching for hours and prefers to play with smaller dogs." Shayla the Dakotah Shepherd at 1 year old sitting out in the grass.